Aircraft spotters could really enjoy a seat in Avaya Stadium’s south stand, where one can see very closely how airplanes take off across the street. New home of San Jose Earthquakes had its soft launch yesterday. Official ribbon-cutting ceremony took place on Friday and yesterday fans were able to enjoy Avaya Stadium for the first time. On the pitch the hosts, San Jose Earthquakes, took on LA Galaxy in the California Clasico. And while it was only a pre-season friendly, the game was sold out. 10,000 seats were available yesterday, which represents 55% of the stadium’s final capacity of 18,000. The limit on entries was intended to allow smooth service as the event was Avaya Stadium’s soft launch. First official game is scheduled for March 22, when the Quakes play against Chicago Fire. The stadium’s first test went very well, with no major criticism from fans. Quite the opposite, already after its first matchday the stadium and photos of airplanes together “landed” in social media. Airplanes will be a common sight for match-goers as the stadium has its north end open and two runways of the Mineta San Jose Airport across the street. 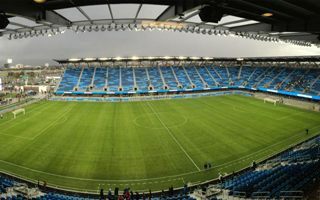 Worth roughly $100 million, the stadium is MLS’s newest venue and the first to truly call home for San Jose Earthquakes. While it’s not an MLS standard, nearly all seats in the stands are covered (aside from 4 lowest rows). Corporate seating covers 3,200 seats in central stands and in lowermost rows around the field. Construction was long overdue in terms of the MLS, because groundbreaking took place back in 2012. But from the very start the project suffered from some difficulties, beginning with concrete sarcophagi found underground. All in all the delivery date had to be moved from 2014 to 2015. Structurally, the new stadium was largely erected with steel prefabs, 90% of which included recycled material. In terms of sustainability, aside from the recycled steel, the stadium will also offset all of its energy use by 882 solar panels placed south of the stadiums. While matchday use requires more power, the stadium’s everyday collection will give back to the grid all of the energy used on event nights.